The shocking death of a vibrant medical practitioner has thrown the Department of Surgery at UNIBEN Teaching Hospital in Edo state into mourning. A senior registrar in the Department of Surgery, University of Benin Teaching Hospital (UBTH), Dr. Okeoghene Edigba, has died. 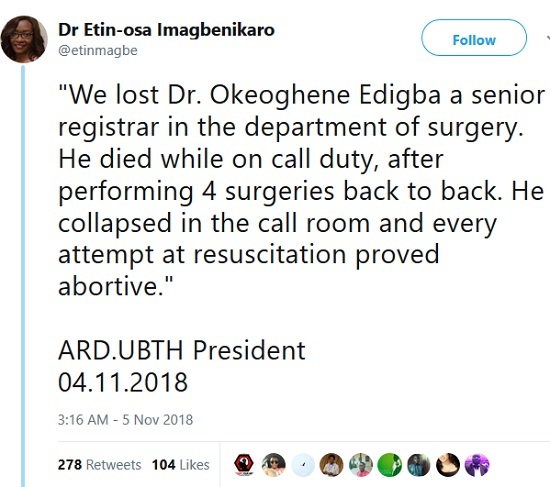 According to Dr Etin-osa Imagbenikaro, President of the Association of Resident Doctors (ARD), UBTH Chapter, Edigba collapsed and died after performing four surgeries back to back. ‏Announcing the tragedy on her Twitter page, @etinmagbe, Imagbenikaro wrote: "We lost Dr. Okeoghene Edigba a senior registrar in the department of surgery. "He died while on call duty, after performing 4 surgeries back to back. 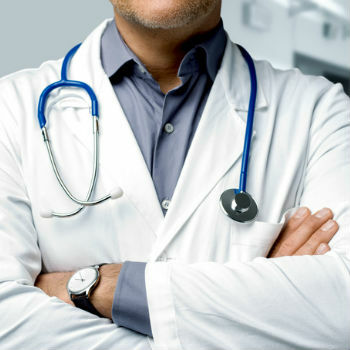 He collapsed in the call room and every attempt at resuscitation proved abortive."